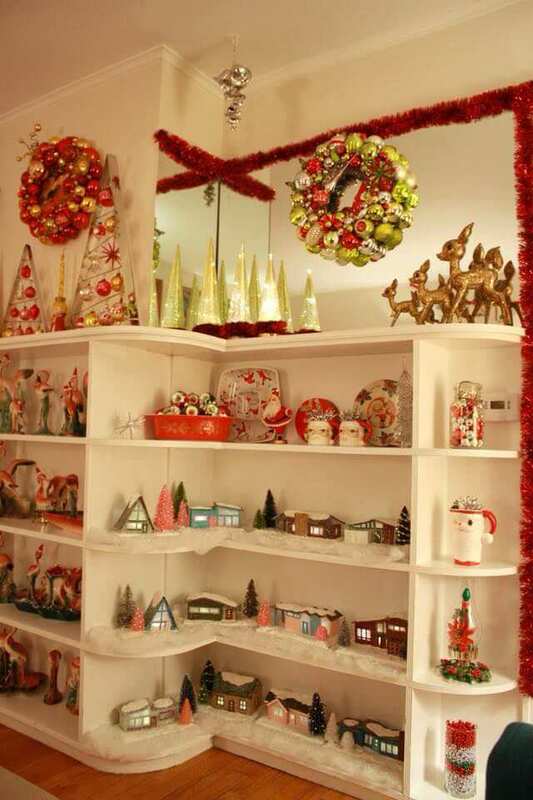 Home » Holiday » Erika has made all of our mini mid mod putz house patterns ! Reader Erika says she’s made all of our mini mid mod putz house patterns. Super impressive – this photos will make Katiedoodle super happy. Hey. I’m having lotsa guests on Turkey Day. I think I will cut out a lot of the patterns ahead of time (darn, wish I had a crickut!) and we’ll do this as an activity while we’re cocktailing. Oh, did I mention that Erika has it GOING ON. Above: Here amazing flamingo collection. And, she’s made vintage ornie wreaths, too. I want to be your best friend, Erika! Alls our putz house patterns here. Our world-famous vintage ornie wreath-making tutorial here. Erika has wreath-making skillz too! Oh. Vintage ornie wreath giveaway coming momentarily. The one and only, first and fabulous GeorgiaPeachez working on my order. Note: Links to Amazon may net me a wee commission if you clickiloo and buy. Nice built-in bookcases and very nice holiday display with the putz houses and orni wreaths. The December Country magazine has a page of DIY wreaths and one of them is attaching vintage ornaments to a frame. Thanks for sharing; helps to put one into holiday mode. I am jealous of everything in this picture! Beautifully done and displayed! Happy Holidays indeed! Love the putz houses, but those flamingos! I have a smaller collection of similar ones. I’m always on the lookout for the vintage ones with that kind of coloration. I love those flamingos. If one was looking to start collecting them, do you have any suggestions as to what we should look for? Thank you. Love Erika’s collections but especially love the flamingos. The whole display is very happy. Great job on the putz houses! Love the putz houses Kate designed. I know Kate’s busy with her own life but I feel like we need a RR reunion show for Christmas. ???? 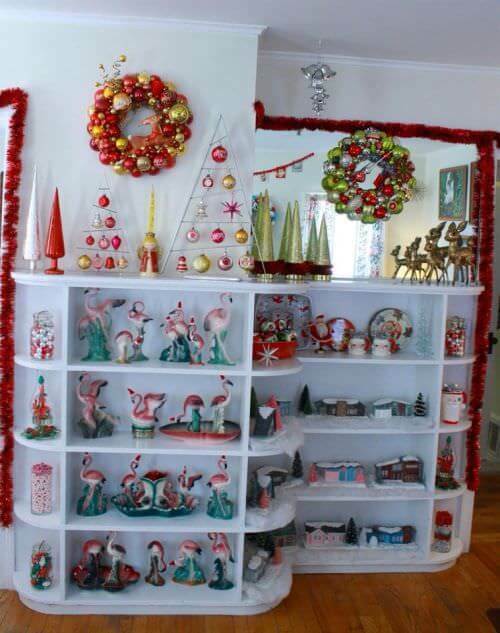 I just might have to get out the glue gun again this year…if I do, you guys will be the first to know!